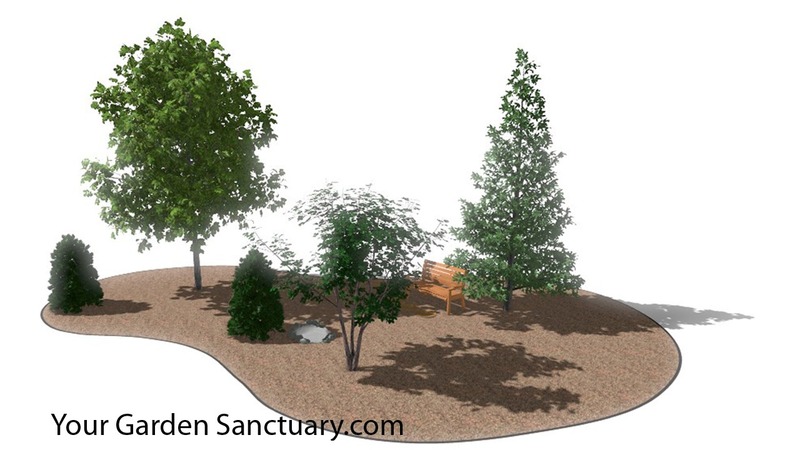 Last post, I showed the start of a wildlife friendly garden design and selected a Swamp White Oak tree to anchor it. That tree was chosen due to the high value it provides to wildlife and due to its high carbon sequestration rates. 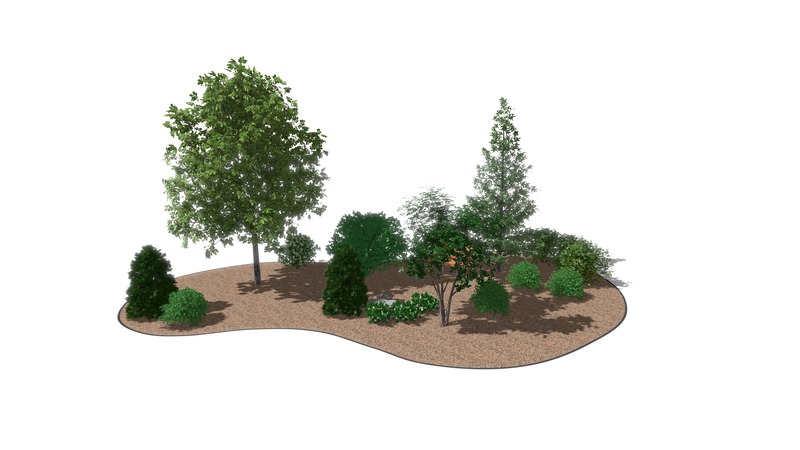 Now we are going to add some additional trees and shrubs to make the planting an even more wildlife friendly garden. 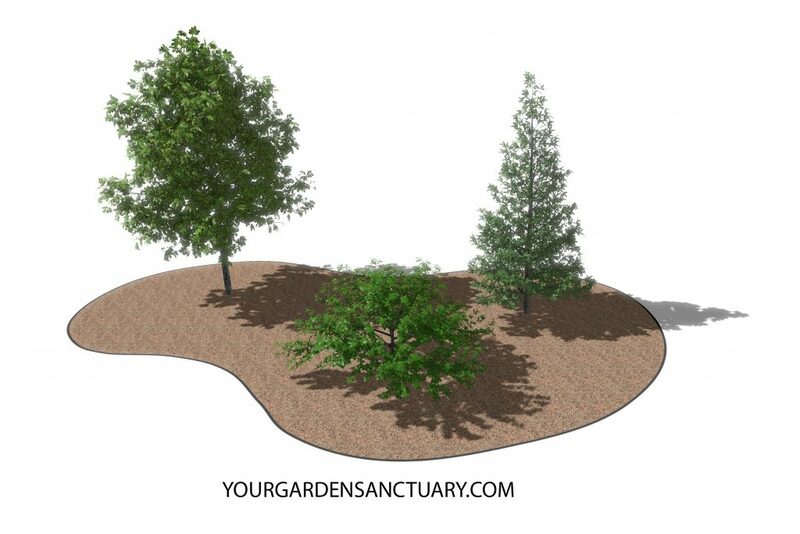 Trees form the backbone of our design, here are three of them (Swamp White Oak, Black Hills Spruce and Musclewood). First, let's pick the evergreen tree. In Northern Illinois, there are very few native evergreen trees. 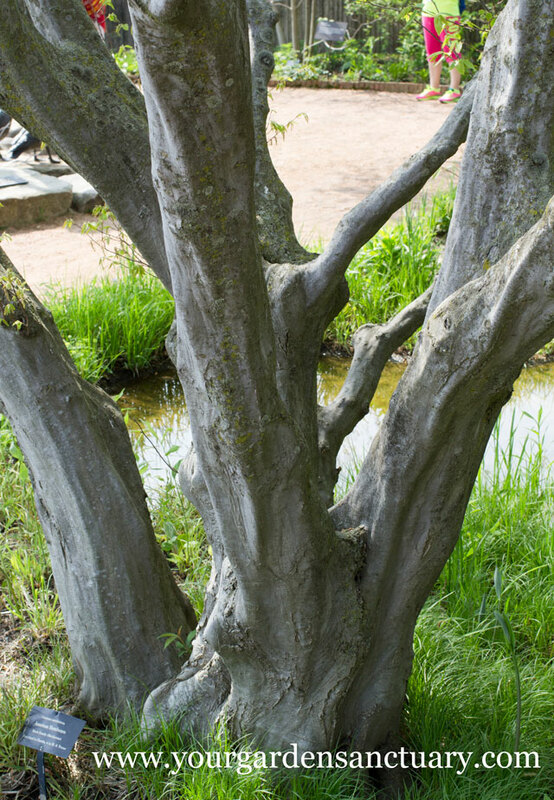 Eastern red cedar (Juniper) is the only real one. There a few instances of white pines, white cedar, and Canadian hemlock in the general area so we will consider those as possibilities. 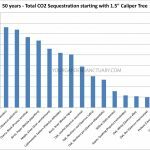 To pick the evergreen to use, I first went to the I-Trees application I used previously and found carbon sequestration rates of the different evergreens I was considering. I found CO2 sequestration was directly related to tree size and growth rates. Not surprisingly White Pine (Pinus strobus) was the best at pulling carbon out of the air. However, we are not looking for a tree that grows really big. Since this evergreen and the rest of the plants will be smaller, we will stop considering CO2 sequestration. However, we will still consider the wildlife value of these evergreens. We will again use the number of caterpillars that each tree supports as given on the National Wildlife Federation (NWF) website as our measuring stick for wildlife value. 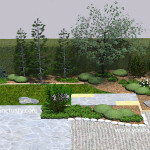 See my post on Landscaping for your grandchildren for more info. Pine is 1st on our list of evergreens, but again we don't want a big tree so we will rule those out. Number two on the NWF list for my area is Spruce (Picea) with 79 caterpillars supported. This is true even though there are no true native populations of spruce in the Chicagoland region. Since we are more concerned with our planting supporting local biodiversity then whether its Birth Certificate says it is a resident of Illinois or not, I will select a nearby native, the Black Hills Spruce (Picea glauca 'Densata'). 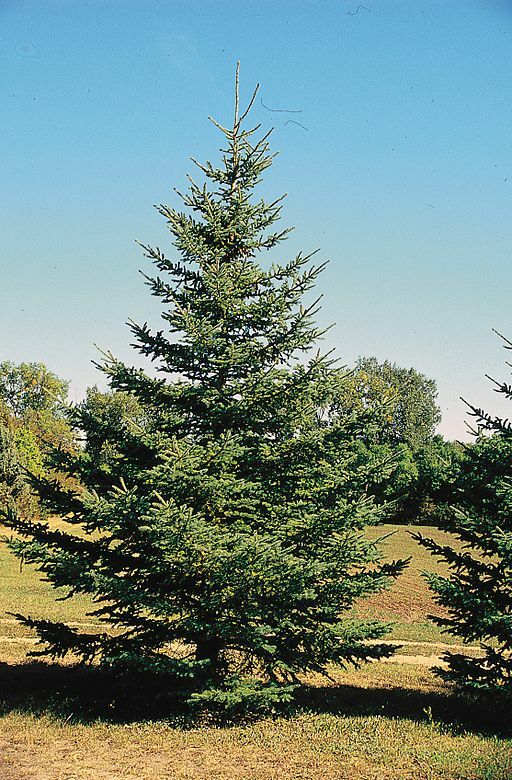 This is a variety of White Spruce that will stay a manageable size, with a height of 20 to 40 feet with a spread of 10 to 15 feet. It is also a common landscape plant that is easy to find. Now, let's select the tree at the front of the design. We will go straight back to our list of trees and the native caterpillars they support. We will just continue down the list to find some small trees that fit the design. Here is the list of six small trees that would work well in our design ranked in the order of their food chain value (the number caterpillars that feed on them) and thus how well they fit into a wildlife friendly garden. Later we will pick some shrubs and I already know some of them will be Dogwoods and Viburnums, so we will pass on the 1st two of our list. I also use a lot of Serviceberries in my designs (because it is such a great tree) so I will pass on that as well. 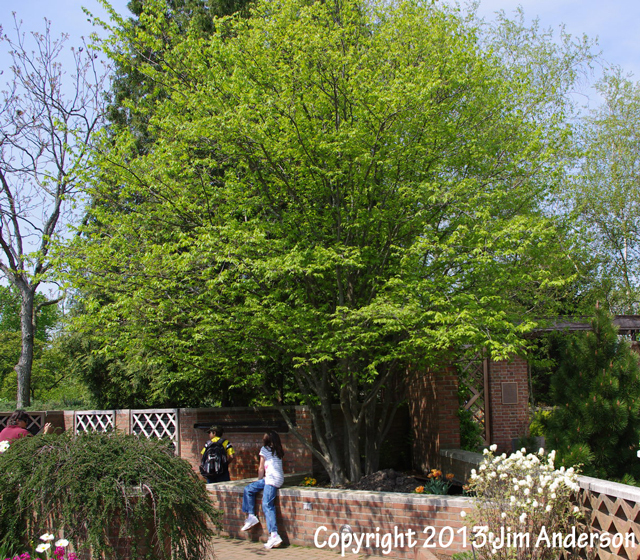 Ironwood gets a bit too wide for this spot, so we will go with #5, the American Hornbeam (Carpinus caroliniana). Besides being a great wildlife plant, the American Hornbeam also offers clean summer foliage, nice yellow to orange fall color and once it ages a bit, outstanding winter bark that looks like muscles. Besides the 69 species of caterpillar that feed on its foliage, other benefits of this wildlife friendly garden tree include Gray Squirrel and Fox Squirrels eating its nutlets. Wood Thrush also builds nests in its branches as well as chickadees in the hollows of older trees. It is called musclewood for a reason. As we only have one evergreen plant and this design is for the McHenry, IL area where winter is at least four months long, lets add a couple Technito® Arborvitae (Thuja occidentalis 'BailJohn'). 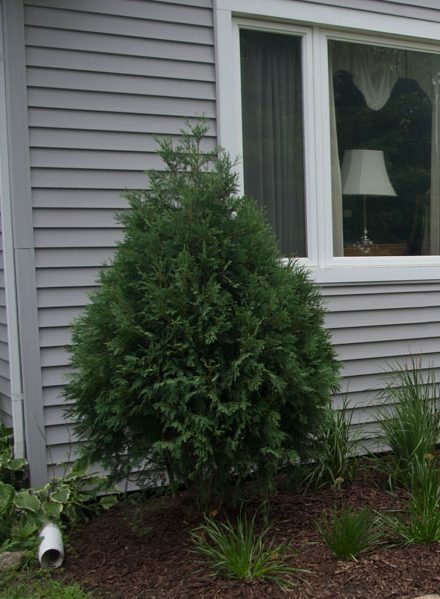 This is a smaller growing version of the popular Techny Arborvitae. It has a compact pyramidal habit, dark green foliage, reddish-brown furrowed bark, and good winter color. 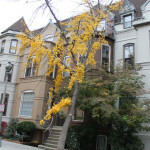 It will also provide birds with a great place to shelter in all seasons, but especially winter. A Technito Arborvitae I planted this Summer. Before we add the rest of the plants, let's add some features to our landscape so we can enjoy it some more. 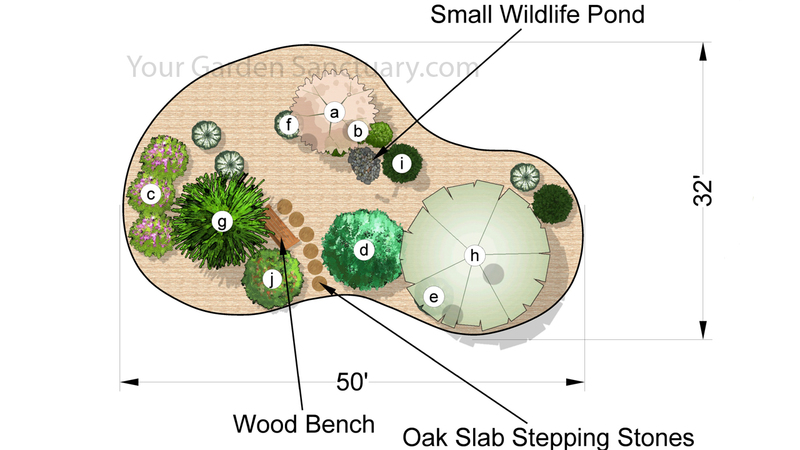 We will add a bench, a stepping stone path made out of oak rounds, and a small wildlife pond to look at as we sit on the bench watching the activity in our wildlife friendly garden. 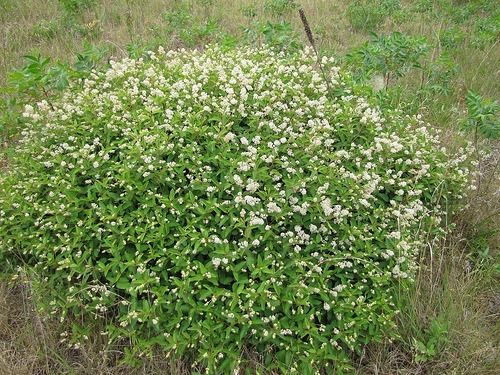 Now we will add shrubs which were selected for year-round interest and high wildlife value using the NWF website. 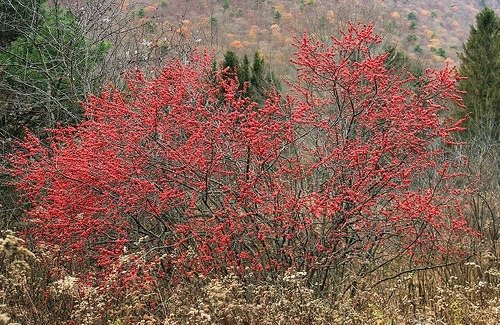 Dwarf redtwig dogwood provides Spring flowers, fruit for birds, red winter stem color. Dogwood support 102 species of caterpillar in the McHenry area. Hazelnut provides nuts for animals and people as well as attractive fall color. (113 species supported). This is a male cultivar of winterberry so that the 4 females Red Sprites have their fruit pollinated. Just a shrub otherwise. (Winterberry supports 41 species of caterpillar). Wonderfully bright red berries in winter add a tremendous amount of winter interest and food for birds including Eastern Bluebirds, American Robins, Cedar Waxwings and woodpeckers throughout winter. 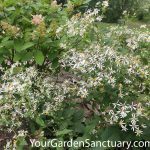 Bright white flowers that pollinators love and a mounding shape make this compact shrub a very popular garden plant. New Jersey Tea also attracts hummingbirds that eat the tiny insects that pollinate the flowers. Nice red tinged spring foliage and white flowers, great red fall color and red fruit which birds feast on in fall/early winter. (Viburnum support 91 species of caterpillar). 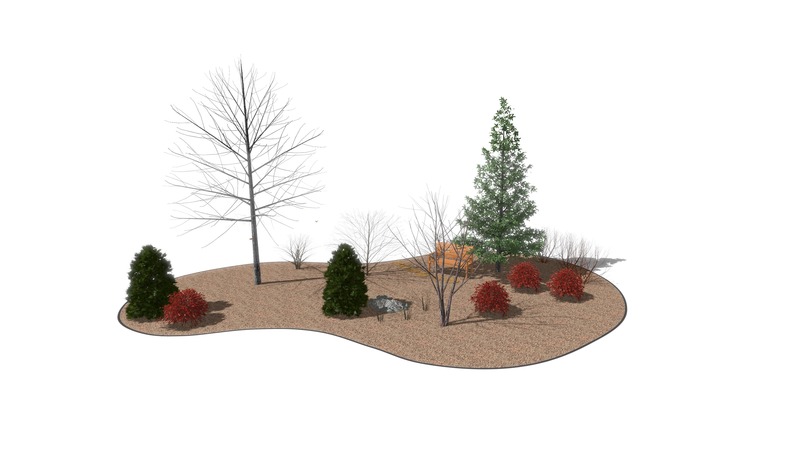 Here is a visualization of how it would look up to this point in the different seasons (before we add the perennials understory layer). 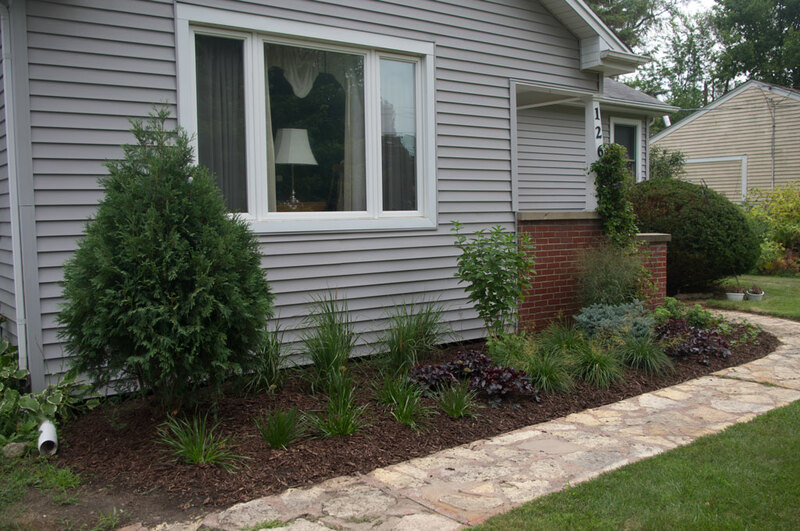 Next time we will finish this wildlife-friendly garden design by adding in a native perennial and ground layer that not only looks great but brings even more life into this yard. Click Here to Subscribe now to make sure you don't miss it. Would you want a 70 foot statue in your yard? Wow Jim, this is a great post with some very fascinating information. I love your blog and all of the knowledge that you share within. I love this design and the inspiration behind it! May I ask, which program do you use to create your mockups? Thank you! Can’t wait to see the final touches! This is such a fun and informative series. Thank you for the ideas you put out there. Can’t wait to see the ground cover layer! 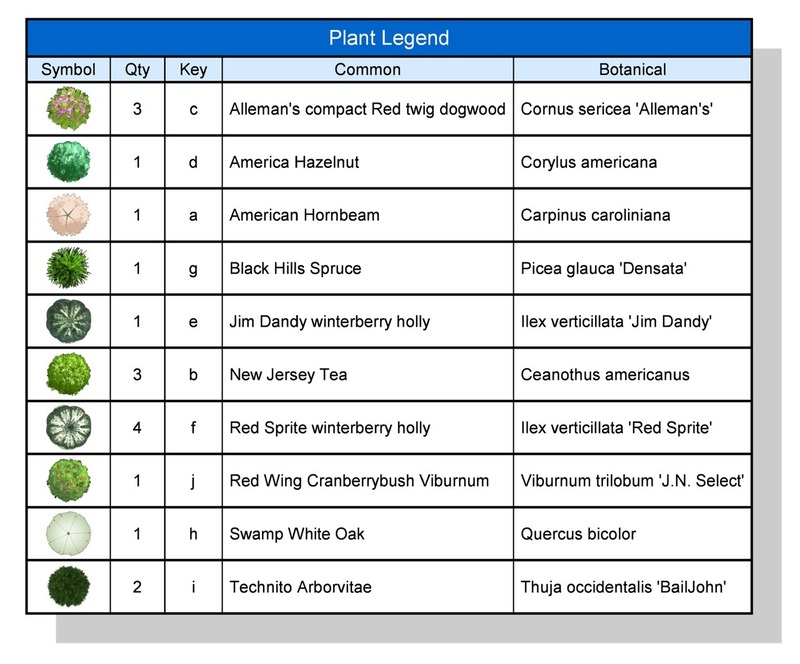 It’s so helpful to see the order in which you pick your plants.